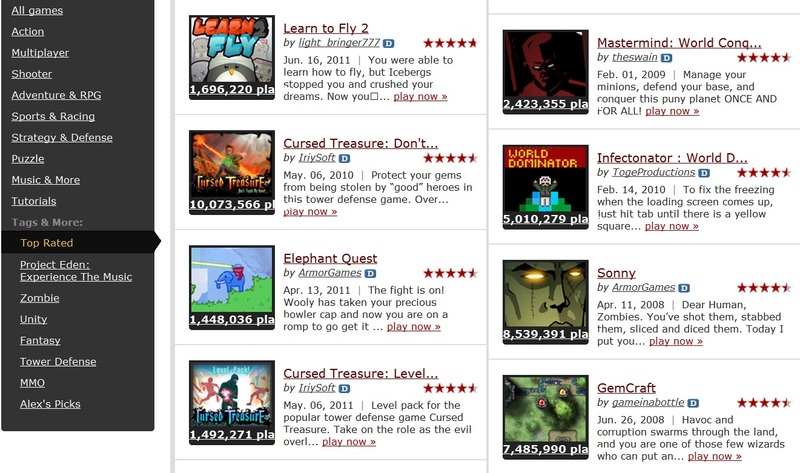 Kongregate is my single most-visited website. Since my first log-in three and half years ago, I have spent an insane amount of time on this flash gaming portal. What is Kongregate, you ask? Well, it’s a flash gaming portal. Similar to sites such as Newgrounds or ArmorGames, Kongregate contains a huge collection of over 44 THOUSAND (1% are good, so that’s 440) online flash games. From small, 5 minute office-break games to huge, hours-long full-length RPGs, Kongregate has every flash game you can think of – excepting Japanese ones, because Japanese flash games are just creepy. Even if for some reason, you want to play a horribly made 12-year-old level game, guess what? Kongregate has 43 thousand of those! Hooray. What makes Kongregate different from other portals? For one, Kongregate is a purely game-based website – flash videos, animations, and the like don’t count as ‘games’. Neither should art or sound, but Kongregate recently got an expansion – Kongregate Collabs, which allows people to collaborate by sharing/commissioning artists/musicians. I’m pretty sure it doesn’t work, what with the quality of the submissions, but that was merely a side note. Secondly, Kongregate has an interesting idea – Kongregate Badges, similar to Xbox Achievements and the like. It’s certainly not a new idea, but it has worked, even prompting Newgrounds to ‘copy’ them with their medals idea (which is actually pretty different, but you can see the resemblance). 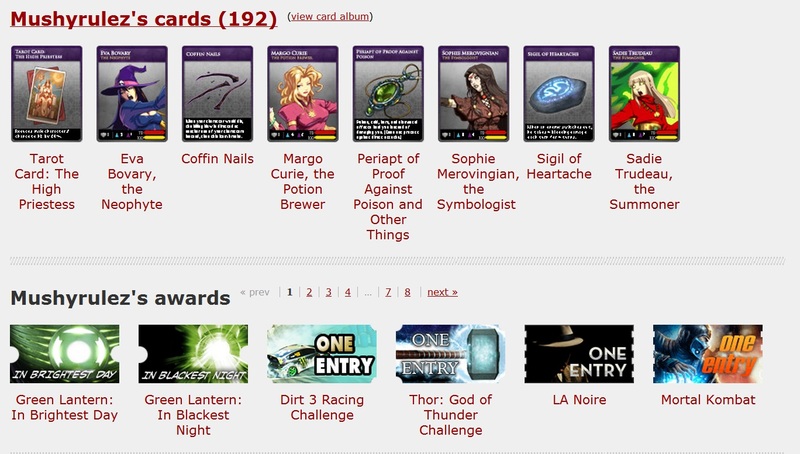 Kongregate Badges/Achievements are things that are awarded with the completion of certain tasks in-game. For example, in a shooting game, it might be ‘get 50 headshots’. In a racing game, maybe ‘get under two minutes in every track’. A long RPG might have ‘complete the game’, but an arcade game might have ‘complete the game without losing any health’. 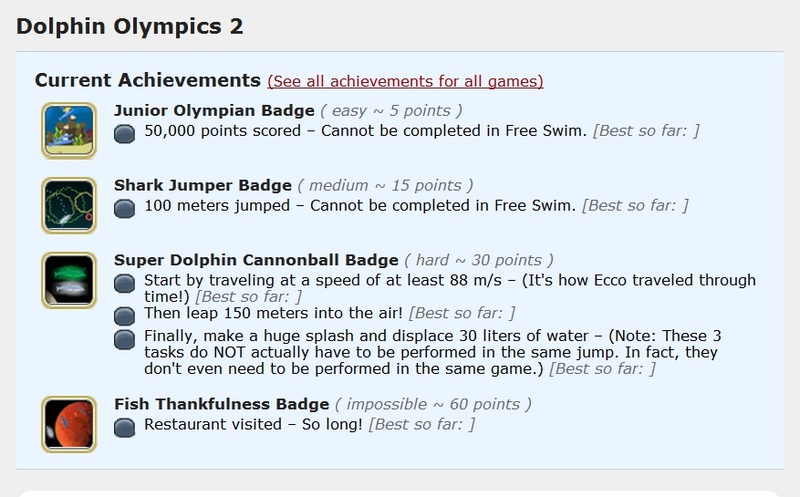 Once you finish an achievement, you get the badge associated with it, and a set amount of points based on the difficulty of the achievement – 5 for easy badges, 15 for ‘medium’ badges, 30 for ‘hard’ badges, and 60 for ‘impossible’ badges. This does not mean it takes the same amount of skill to get an impossible badge as it does to get 12 easy badges – getting a medium badges is usually much harder than getting three easy badges, getting a hard badge much harder than getting two mediums, etc. This brings us to the next innovation – levels. Newgrounds has had this for a long time, but other flash portals don’t have the resources to implement the idea. Kongregate Users, after accumulating a certain amount of points, will level up. The highest level right now is 65, which needs 36,560 points to get to. You’re right – Kongregate has only been alive for 5 years, definitely not enough to make >2500 badges. You can earn Kongregate points by rating games (up to a maximum of 50 a day), collab art/sound (max 10 a week), and custom user levels (levels that users create on certain Kongregate games that have them – see picture below; max 10 a week), as well as referring friends and uploading games. That’s one of the two biggest attractions that Kongregate offers – a simple, hassle-free game-uploading process. Other portals usually have the administrator manually put games in, and sometimes only games that the portal sponsors – however, Kongregate accepts any and all games, no matter how stupid it is. This is a mixed blessing, but more of a blessing than a curse – after all, coupled with Kongregators’ frequent need to rate games (remember, rating games give points, and points give levels, which give… hmmm) and Kongregate’s badge system, people can easily ignore all bad games on the site – either by only playing games with badges, or by playing high-rated games. With so many members (well over the millions by now), ratings are always accurate – if you notice a mistake in rating, chances are, hundreds more will probably notice and correct it. 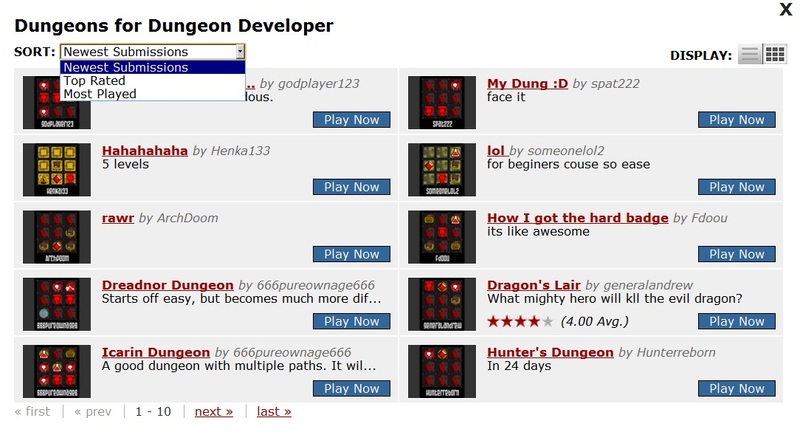 The final, largest attraction of Kongregate is its community, especially its chatting system. You see, on the right hand side of every game page is a chatbox, where you can chat with other people on Kongregate who are also playing games (though not necessarily the same game as yours). Instead of it being a random chatbox where you meet different people each time, the chatbox is organized into many, many ‘rooms’. ‘Regulars’ (regular members) in these rooms typically chat in the same room each time, so by chatting a lot, you’ll quickly feel a sense of community among the members of Kongregate. This is undoubtedly the most unique feature of a flash gaming portal, ever – I’ve yet to see another site that implements this idea, and to such a large scale. Literally hundreds of people are /actively chatting/ at any given moment, and many thousands more ‘lurking’, or just reading what other people are talking about without talking themselves. Of course, the vast majority are silent ‘I-came-here-on-my-coffee-break-to-relax’ gamers, but that’s alright – you wouldn’t want 200+ people talking at the same time, would you? Kongregate’s point/achievement-based levelling system, vast horde of free online games, and unique sense of community combine to make Kongregate truly my favourite flash gaming site. My opinion may be heavily biased. Now, allow me to talk about my Kongregate story, and why I eventually decided to quit. I joined Kongregate three and a half years ago after accidentally clicking a sponsor link on onemorelevel.com (who happens to be the second most-referred person on Kongregate, and also the creator of AddictingGames) while sitting in front of my computer eating lunch during my school lunch break (cause I went home for lunch then). It seemed like any other flash portal, and I liked onemorelevel’s simplicity, so I didn’t bother signing up or anything. A day later, my brother found out about Kongregate, joined, and completed a Kongregate Challenge. A Challenge is like a badge, except it only lasts for a limited time (usually a week) and awards you with a Kongregate Card to use in their card rock-paper-scissors game, Kongai. Obviously, Kongregate got the idea of Challenges from those television ads, where they keep on telling you how it’s just a limited time offer. Of course, limited time offers are extremely appealing, and I immediately registered and attempted to complete every challenge Kongregate issued. This lasted for about three years, until last year, when I went to Mexico for an extended period of time. Having missed a challenge, I felt no reason to continue completing challenges, and thus continued completing challenges. During those three years, I did many things in Kongregate – post random crap on the extremely-active forums, post some comments, favourite some games, add more than a thousand people as friends, talk to random strangers on the chat rooms, and become a badge whore. After a while, I also went to China, discovered Touhou, started posting on other forums, got a twitter, got a blog, and started to aniblog. Eventually, Kongregate went from being my number 1 all-the-time only-site-on-the-internet website into being just a minor distraction, which I only played to get achievements and talk to random strangers on the internet. Half a year ago, I missed my first challenge, and I also realized that having over 1,500 people as ‘friends’ on a flash gaming site was pretty nerdy of me, so I promptly went through all 60+ pages of friends and deleted them all, as well as all of my 200+ ‘favourite games’. To make up for my lack of points in achievements, I started mass-rating games, art, and levels, to try to increase my level. Kongregate has really changed over the years. Before, it was extremely simple in design – just a few games, some had badges, one got a challenge every week, you would get points if you rated games, and there was a nice chat/forum system. After a while, things started changing – the homepage got more cluttered, more sponsorship stuff started appearing, badges started getting their own page, the homepage got a slideshow of current challenges, games were organized into categories, the Shootorials were created (to help noobs program), then the Collabs (to help programmers get free art/music by capitalizing off unsuspecting 12-year-olds), then raffle tickets (of which I never won a single one! ), Buried Treasure Week (which was the best week Kongregate ever had), actually releasing Kongai, creating the Kreds system (which I ranted on and on about at the time, but it actually didn’t affect anything), sponsoring special Kongregate Multiplayer Games (I remember “Argue!” was a particularly frustrating game which wasn’t fun to play at all), special ‘double points’ limited-time challenges, and eventually, a new comment-rating system, reintroducing the old tag system, adding the ‘Badge of the Day’ (where you would get double points if you finished the badge of the day), and finally being acquired by GameStop for a rather large sum of money. From its humble beginnings in 2006 as a small flash portal created and maintained by Jim and Emily Greer, Kongregate has jumped in popularity and complexity – what once attracted me as a small site with points and a chat system is now a huge mess of everything. I’m not against big websites or anything, I’m just jealous of them. So, why did I quit Kongregate? It wasn’t because of any of the reasons above, actually. That was just to make my post longer so less people would get to this part. After having watched that episode of Moshidora where the main tries to define the purpose of their team, I realized – I have no purpose to staying on Kongregate. I’m here to play games. Why? To get badges. Why? To get points. Why? To level up. Everything I did on Kongregate started to revolve around levelling up. I tried to trick myself, saying that rating 50 worthless games every day was just to see how each different game worked and to get ideas on game design, but that hasn’t actually helped at all. I did all that to get points, I got points to level up, and I levelled up to…? What is there on Kongregate that a high levelled person can do that a unregistered person can’t? Nothing! That’s also one of the reasons Kongregate is a very attractive website. You don’t ever feel like a noob. I can still do everything that I could do with an account, without an account. The one thing I can’t is chat – and why do I chat? I tricked myself into thinking that chatting would help me in some way in the future, maybe to make friends or whatnot, but that’s all too much hassle than it’s worth. Indeed, I got far too addicted to getting points, not to playing games, and even if I didn’t get addicted to getting points, I would get addicted to playing games, not analyzing them. I even used Cheat Engine to get some badges, thinking: “Well, if I get to the end, then I’ll understand how the game works! This will help me in the future… somehow.” In an effort to cheat for a final badge, Sacred Seasons MMORPG, I went onto a Kongregate hack site and saw just how much effort needed to be used, just how much talent had to be utilized, just how much time was wasted, and on what? On nothing! Absolutely nothing at all. I looked at the huge list of badges that I ‘needed’ to complete, and it’s just way too much work. Notice that. Work. Not fun. Work. When playing flash games is too much work, you know you need to quit. The final reason to push me towards this is the time. It’s summer. It’s time to DO THINGS. Do things that I can’t do when school’s in session. I could use this time to play flash games, more flash games than I could possibly play otherwise… or I can do more productive stuff. In conclusion, it’s been a long time. Three and a half years. That just goes to show you, not how badly I was addicted, but how awesome the site was. Goodbye, Kongregate. I’ve addicted at least a dozen more. This entry was posted on 2011/06/27 by Mushyrulez. It was filed under Gaming and was tagged with Flash, Gaming, Kongregate, Life, Links, Mushz, O-REW, Reflections, Sad, Screenshots. Kongregate: Like crack, but cheaper, and therefore more Asian friendly. Damn you, you pyramid-scheme mushroom, you. Aside, I’ve spent too much time (not nearly as much) on Kongregate as well. At first I went on badge grabbing rampages. I searched the Badges page for medium and easy badges to quickly swoop up. Then I’d try and obtain impossible badges (only got two, and used glitches for both: amorphous+ and cell warfare. to be fair, i only used glitches in amorphous+ to get the friggin razor queens, horrors, grays, and void eaters to spawn) and fail. Now I still visit, but this time I just browse the scroller bar for games, and the “Hot New Games” section. That’s it. I’ve stopped a point madness. Now I just play games if they’re fun, not playing gimmicky tower defense games to get a single random medium badge. BTW, Mushy, RPG Shooter: Starwish is actually worth playing on Kong. Also, Epic Battle Fantasy 3 if you hadn’t already finished it. I’ll continue playing games when I feel like it, but there are funner things to do in life.